This archived podcast and extended question-and-answer session first appeared at SAGE Connection. Why do some researchers choose to publish in open access publications while others avoid it? To better understand their perspectives, SAGE (the parent of Social Science Space) organized a webinar entitled “Faculty Perspectives on Publishing Open Access” during Open Access Week in October. Guests were professors Alan Daly of the University of California, San Diego, Bruce Herbert of Texas A&M University, and Shannon Audley-Piotrowski of Smith College. 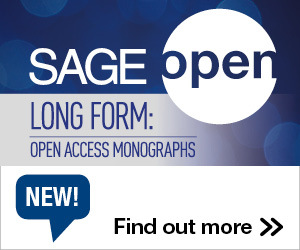 The webinar was moderated by David Ross, executive director for open access at SAGE. You can watch the entire webinar above. You can also find the presentation slides HERE. An arcive of the live chat feed can be found here: OA Webinar 2015 Chat. Though the speakers did not have enough time to get to all of the questions during the Q&A portion of the webinar, Herbert and Ross answered some of the remaining questions below. This is an interesting question that requires a bit of a nuanced answer. The question is do you want characteristics of a scholar’s work or do you want to be taken seriously by the P&T committee? Do you want scholarly impact? To do public good? If it is the former, then traditional measures of scholarly impact, such as citations, plus expert review provides the evidence. Bibliometrics research has generally shown that scholars that improve the access to their scholarship reap great scholarly impact. If it is the latter (i.e. public good), then this will likely have a minimal effect on a P&T committee because publishing OA as an individual scholar likely has a minimal impact on the public good. The promise of OA is linked to making (almost) all research accessible. The lack of impact metrics for public good, analogous to the citation, is likely going to limit this in P&T decisions. My team in the Office of Scholarly Communications thinks this is a really significant research need. Finally, look toward the professional societies, like the Modern Language Association, to drive community adoption of OA publishing as a community value. MLA has adopted “a new author agreement for its journals (including the flagship PMLA) that will leave copyright with authors, enabling them to post versions in open access repositories, or on individual or departmental websites.” In addition, they have created a disciplinary repository to make their research accessible called the MLA Core (https://commons.mla.org/core/). 2. Publishing in gold OA journals is a laudable goal, but what about green OA? According to Peter Suber, most toll-access journal publishers now allow authors to self-archive in OA repositories. That seems like a much easier sell to faculty to me. Works for me! We have had great success in selling this option by doing three things: (1) distributing an information sheet that provides research-based statements on the impact of green OA on citations rates, (2) improving the user interface of our institutional repository, and (3) providing better outreach of disciplinary repositories like ArXive or SSRN. Email me if you would like more details: beherbert@library.tamu.edu. 3. In my experience, the reason people say no to OA is the lack of peer review. Can anyone confirm that this is usually the case, or explain how this might not be so? Interesting, I have never heard that one. I think if I got this response, I would counter with the peer-review used by a specific journal. If they are using a predatory journal or poor quality journal as an example, I suggest you counter with PLOS One or SAGE Open. And then challenge them to publish in a reputable journal. 4. What’s making predatory practices so effective and attractive to faculty? We know the answer to that one but we’re not ready to address it. I see no evidence at all that predatory journals are making any kind of inroads at Texas A&M. As I mentioned in the webinar, we had one case out of about 180 applications to our OA publication fee fund (OAKFund) that requested money for a predatory journal and that was really suggested by a graduate student, not the faculty author. The question/concern I get the most from faculty is about any trade-offs to publish in an OA journal versus the traditional journals they trust. 5. Why are faculty wary of online-only journals? Plenty of subscription online-only journals come with high impact factors, high-quality peer review, a good reputation, and more. Does the existence of print format still make a difference? Do dinosaurs still walk the Earth? I don’t know. I know lots of folks that like to read print instead of a computer screen, perhaps that is their complaint or maybe they lack computer skills to take advantage of online journals. In the Sciences, we rejoiced when journals finally went online. 6. Is there a direct connection between OA publishing and civic engagement? Interesting to consider. Let me take a stab. Open access is acknowledged to serve the public good. That may or not affect civic engagement. I think we can look for a stronger causal link between civic engagement and the open access applied to government documents and data – the open government movement (which libraries could support). If you believe that governmental transparency leads to citizenry engaged in civics, then this may be a good way to go, perhaps through partnerships with local government. In general though, there are few specific examples where open access caused a specific good. We have one at Texas A&M, where we support the transformation of K12 STEM education at one rural school district that lacks a library through open access and digital collection development of agricultural experiment station bulletins. I think this is a rich research area to characterize the conditions and prerequisites where open access causes a specific good. 7. What tools do you use to identify quality gold OA other than, DOAJ, ROAD, Cabell’s, Scopus & JCR? I use the reputation of the publisher, especially professional societies such as the American Geophysical Union, which has created three great OA journals (http://agupubs.onlinelibrary.wiley.com/agu/unlocked-open-access.html). We have used Beall’s list a bit to judge OA journals we support through our OAKFund. It is often the first source we look to for a journal with which we are unfamiliar. Generally, we use many other sources of information to judge an unknown OA journal and not just Beall’s list. 9. Do you have a list of criteria for what is deemed “reputable” for your scholars? Sure do. Four criteria: (1) reputable publisher, (2) high-quality papers published by the community of scholars with which an author wants to associate, (3) specific research area (as opposed to those strange OA journals entitled “Journal of most sciences, a bunch of emerging engineering areas, and music theory”), and (4) innovative scholarly communication practices such as linking to research data or article-based altmetrics. 10. Can we transform the cooperative extensions into scholarly communication outlets for all information (more than agriculture)? Great idea, one which we have discussed specifically in the Office of Scholarly Communications. So let me start with why this is not easy. Ag extension worked because there were professionals with the knowledge to translate research in practical advice while also have a strong knowledge of the local context (the weather, the types of crops, the soils – all of the factors that affect local agricultural production). That is why ag extensions agents are distributed all over a state, not just based at the land-grant institution in your state. Providing this kind of extension was and is costly and likely to never be duplicated again. Assuming this is right, then you need a source of expertise both about the research and the context with which this research would be applied. And it is not likely to be replaced by a community of actual people. Unless this issue is solved, then I predict the impact of open access will likely be very uneven, where the benefits will accrue to those richer groups and organizations that can hire the right expertise to bring the right research to bear on their problems. If open access is to bring more universal impact, systems will have to be developed to take advantage of this vast literature (we haven’t even started talking about the research data that will become available soon through the federal mandates). In my opinion, this is one of the greatest research needs surrounding open access. I am interested in talking with others that have interests in this area. Please feel free to contact me at beherbert@library.tamu.edu. 1. Do articles published in the green zone also require an APC? It should be noted that that this form of OA has plateaued and that it makes a lower and lower proportion of the OA output over time. For a fuller explanation please refer to the original article which can be found here. 2. How can you build a peer review process into open access? This question raises a common misconception that peer review for OA journals somehow differs from traditional subscription journals. It does not. The peer review process for OA journals can be exactly the same. Some OA “mega-journals” (e.g. SAGE Open, PLoS One, PeerJ) do not assess for novelty, looking at methodological soundness only, but all articles are double-blind peer reviewed by a minimum of two experts in the field. 3. How are gold OA and hybrid OA different? They both seem to rely on payment to place content in a repository? Hybrid OA is a form of Gold OA. Pure Gold OA refers to papers that that are published in journals that are completely open access – generally online only but some have print versions. Hybrid OA refers to papers that are published in traditional paywalled subscription journals that the authors wish to make OA – e.g. the SAGE Choice option. In both cases they pay an Article Processing Charge (APC) and in both cases they would be released under a Creative Commons licence. They would not necessarily be placed in a repository in either case. That would only be done if the author wanted to, or the authors’ funder or institution required it. This entry was posted in Open Access and tagged Webinar. Bookmark the permalink. Post a comment or leave a trackback: Trackback URL.